This article is about the media franchise. For the title character, see Sailor Moon (character). For other uses, see Sailor Moon (disambiguation). "Pretty Guardian Sailor Moon" redirects here. For the 2003 TV series, see Pretty Guardian Sailor Moon (2003 TV series). Sailor Moon (美少女戦士セーラームーン, Bishōjo Senshi Sērā Mūn, originally translated as Pretty Soldier Sailor Moon and later as Pretty Guardian Sailor Moon) is a Japanese shōjo manga series written and illustrated by Naoko Takeuchi. It was originally serialized in Nakayoshi from 1991 to 1997; the 60 individual chapters were published in 18 tankōbon volumes. The series follows the adventures of a schoolgirl named Usagi Tsukino as she transforms into Sailor Moon to search for a magical artifact, the "Legendary Silver Crystal" (「幻の銀水晶」, Maboroshi no Ginzuishō, lit. "Phantom Silver Crystal"). She leads a diverse group of comrades, the Sailor Soldiers (セーラー戦士, Sērā Senshi) (Sailor Guardians in later editions) as they battle against villains to prevent the theft of the Silver Crystal and the destruction of the Solar System. on July 6, 1992 featuring Usagi Tsukino as Sailor Moon. The manga was adapted into an anime series produced by Toei Animation and broadcast in Japan from 1992 to 1997. Toei also developed three animated feature films, a television special, and three short films based on the anime. A live-action television adaptation, Pretty Guardian Sailor Moon, aired from 2003 to 2004, and a second anime series, Sailor Moon Crystal, began simulcasting in 2014. The manga series was licensed for an English language release by Kodansha Comics in North America, and in Australia and New Zealand by Random House Australia. The entire anime series has been licensed by Viz Media for an English language release in North America and by Madman Entertainment in Australia and New Zealand. Since its release, Pretty Soldier Sailor Moon has received acclaim, with praise for its art, characterization, and humor. The manga has sold over 35 million copies worldwide, making it one of the best-selling shōjo manga series. The franchise has also generated $5 billion in merchandise sales. In Minato, Tokyo, a middle-school student named Usagi Tsukino befriends Luna, a talking black cat who gives her a magical brooch enabling her to become Sailor Moon: a soldier destined to save Earth from the forces of evil. Luna and Usagi assemble a team of fellow Sailor Soldiers to find their princess and the Silver Crystal. They encounter the studious Ami Mizuno, who awakens as Sailor Mercury; Rei Hino, a local shrine maiden who awakens as Sailor Mars; Makoto Kino, a tall transfer student who awakens as Sailor Jupiter; and Minako Aino, a young aspiring idol who awakens as Sailor Venus, accompanied by her talking feline companion Artemis. Additionally, they befriend Mamoru Chiba, a high-school student who assists them on occasion as Tuxedo Mask. In the first arc, the group battles the Dark Kingdom. Led by Queen Beryl, a team of generals—the Four Kings of Heaven (四天王, Shiten'ō, lit. "Four Heavenly Kings")—attempt to find the Silver Crystal and free an imprisoned, evil entity called Queen Metaria. Usagi and her team discover that in their previous lives they were members of the ancient Moon Kingdom in a period of time called the Silver Millennium. The Dark Kingdom waged war against them, resulting in the destruction of the Moon Kingdom. Its ruler Queen Serenity later sent her daughter Princess Serenity, her protectors the Sailor Soldiers, their feline advisers Luna and Artemis, and the princess's true love Prince Endymion into the future to be reborn through the power of the Silver Crystal. The team recognizes Usagi as the reincarnated Serenity and Mamoru as Endymion. The Soldiers kill the Four Kings, who turn out to have been Endymion's guardians who defected in their past lives. In a final confrontation with the Dark Kingdom, Minako kills Queen Beryl; she and the other Soldiers then sacrifice their lives in an attempt to destroy Queen Metaria. Using the Silver Crystal, Usagi defeats Metaria and resurrects her friends. At the beginning of the second arc, Usagi and Mamoru's daughter Chibiusa arrives from the future to find the Silver Crystal. As a result, the Soldiers encounter Wiseman and his Black Moon Clan, who are pursuing her. Chibiusa takes the Soldiers to the future city Crystal Tokyo, where her parents rule as Neo-Queen Serenity and King Endymion. During their journey, they meet Sailor Pluto, guardian of the Time-Space Door. Pluto stops the Clan's ruler Prince Demand from destroying the spacetime continuum, leading to her death. Chibiusa later awakens as a Soldier—Sailor Chibi Moon and helps Usagi kill Wiseman's true form, Death Phantom. The third arc revolves around a group of lifeforms called the Death Busters, created by Professor Soichi Tomoe, who seek to transport the entity Pharaoh 90 to Earth to merge with the planet. Tomoe's daughter, Hotaru, is possessed by the entity Mistress 9, who must open the dimensional gateway through which Pharaoh 90 must travel. Auto-racer Haruka Tenoh and violinist Michiru Kaioh appear as Sailor Uranus and Sailor Neptune, who guard the outer rim of the Solar System from external threats. Physics student Setsuna Meioh, Sailor Pluto's reincarnation, joins the protagonists. Usagi obtains the Holy Grail, transforms into Super Sailor Moon, and attempts to use the power of the Grail and the Silver Crystal to destroy Pharaoh 90. This causes Hotaru to awaken as Sailor Saturn, whom Haruka, Michiru, and Setsuna initially perceive as a threat. As the harbinger of death, Hotaru uses her power of destruction to sever Pharaoh 90 from the Earth and instructs Setsuna to use her power over time-space to close the dimensional gateway. In the fourth arc, Usagi and her friends enter high school and fight against the Dead Moon Circus, led by Queen Nehelenia, the self-proclaimed "rightful ruler" of both Silver Millennium and Earth. Nehelenia invades Elysion, which hosts the Earth's Golden Kingdom, capturing its High Priest Helios and instructing her followers to steal the Silver Crystal. As Prince Endymion, Mamoru is revealed to be the owner of the Golden Crystal, the sacred stone of the Golden Kingdom. Mamoru and the Soldiers combine their powers with those of the Holy Grail, enabling Usagi to transform into Eternal Sailor Moon and kill Nehelenia. Four of Nehelenia's henchmen, the Amazoness Quartet, are revealed to be Sailor Soldiers called the Sailor Quartet, who are destined to become Chibiusa's guardians in the future; they had been awakened prematurely and corrupted by Nehelenia. In the fifth and final arc, Usagi and her friends are drawn into a battle against Shadow Galactica, a group of false Sailor Soldiers. Their leader, Sailor Galaxia, plans to steal the Sailor Crystals of true Soldiers to take over the galaxy and kill an evil lifeform known as Chaos. When Galaxia kills Mamoru and most of the Sailor Soldiers, she steals their Sailor Crystals. Usagi travels to the Galaxy Cauldron to defeat Galaxia and revive her teammates. Joining Usagi are the Sailor Starlights who come from the planet Kinmoku, their ruler Princess Kakyuu and the infant Sailor Chibichibi, who comes from the distant future. Later, Chibiusa and the Sailor Quartet join Usagi and company. After numerous battles and the death of Galaxia, Sailor Chibichibi reveals her true form as Sailor Cosmos. After defeating Chaos with the Silver Crystal, Usagi revives Mamoru and the Sailor Soldiers, before returning to Earth. The series ends with Usagi and Mamoru's wedding six years later. Naoko Takeuchi redeveloped Sailor Moon from her 1991 manga serial Codename: Sailor V, which was first published on August 20, 1991, and featured Sailor Venus as the main protagonist. Takeuchi wanted to create a story with a theme about girls in outer space. While discussing with her editor Fumio Osano, he suggested the addition of Sailor fuku. When Codename: Sailor V was proposed for adaptation into an anime by Toei Animation, Takeuchi redeveloped the concept so Sailor Venus became a member of a team. The resulting manga series became a fusion of the popular magical girl genre and the Super Sentai series, of which Takeuchi was a fan. Recurring motifs include astronomy, astrology, gemology, Greek and Roman mythology, Japanese elemental themes,:286 teen fashions, and schoolgirl antics. Takeuchi said discussions with Kodansha originally envisaged a single story arc; the storyline was developed in meetings a year before serialization began. :93 After completing the arc, Toei and Kodansha asked Takeuchi to continue the series. She wrote four more story arcs, which were often published simultaneously with the five corresponding seasons of the anime adaptation. The anime ran one or two months behind the manga. :93 As a result, the anime follows the storyline of the manga fairly closely, although there are deviations. Takeuchi later said because Toei's production staff were mostly male, she feels the anime has "a slight male perspective." Takeuchi later said she planned to kill off the protagonists, but Osano rejected the notion and said, "[Sailor Moon] is a shōjo manga!" When the anime adaptation was produced, the protagonists were killed in the final battle with the Dark Kingdom, although they were revived. Takeuchi resented that she was unable to do that in her version. Takeuchi also intended for the Sailor Moon anime adaptation to last for one season, but due to the immense popularity, Toei asked Takeuchi to continue the series. At first, she struggled to develop another storyline to extend the series. While discussing with Osano, he suggested the inclusion of Usagi's daughter from the future, Chibiusa. Written and illustrated by Naoko Takeuchi, Sailor Moon was serialized in the monthly manga anthology Nakayoshi from December 28, 1991 to February 3, 1997. The side-stories were serialized simultaneously in RunRun—another of Kodansha's manga magazines. The 52 individual chapters were published in 18 tankōbon volumes by Kodansha from July 6, 1992, to April 4, 1997. In 2003, the chapters were re-released in a collection of 12 shinzōban volumes to coincide with the release of the live-action series. The manga was retitled Pretty Guardian Sailor Moon and included new cover art, and revised dialogue and illustrations. The ten individual short stories were also released in 2 volumes. In 2013, the chapters were once again re-released in 10 kanzenban volumes to commemorate the manga's 20th anniversary, which includes digitally remastered artwork, new covers and color artwork from its Nakayoshi run. The books have been enlarged from the typical Japanese manga size to A5. The short stories were republished in two volumes, with the order of the stories shuffled. Codename: Sailor V was also included in the third edition. The Sailor Moon manga was initially licensed for an English release by Mixx (later Tokyopop) in North America. The manga was first published as a serial in MixxZine beginning in 1997, but was later removed from the magazine and made into a separate, monthly comic to finish the first, second and third arcs. At the same time, the fourth and fifth arcs were printed in a secondary magazine called Smile. The series was later collected into three-part graphic novels spanning eighteen volumes, which were published from December 1, 1998, to September 18, 2001. Tokyopop's license expired in 2005 and its edition went out of print. Daily pages from the Tokyopop version ran in the Japanimation Station, a service accessible to users of America Online. In May 2005, Tokyopop's license to the Sailor Moon manga expired, and its edition went out of print. In 2011, Kodansha Comics announced it would publish the Sailor Moon manga and the lead-in series Codename: Sailor V in English. It would also re-publish the twelve volumes of Sailor Moon simultaneously with the two-volume edition of Codename Sailor V, from September 2011 to July 2013. The first volume of the two related short stories was published on September 10, 2013; the other was published on November 26. The manga has also been licensed in other English-speaking countries. In the United Kingdom, the volumes are distributed by Turnaround Publisher Services. In Australia, the manga is distributed by Penguin Books Australia. The manga has been licensed in Russia and CIS for distribution by XL-Media publishing company, a subdivision of Eksmo publishing company. The date of release is unknown. Toei Animation produced an anime television series based on the 52 manga chapters, also titled Pretty Soldier Sailor Moon. It was directed by Junichi Sato, Kunihiko Ikuhara and Takuya Igarashi. The series premiered in Japan on TV Asahi on March 7, 1992, and ran for 200 episodes until its conclusion on February 8, 1997. Most of the international versions, including the English adaptations, are titled Sailor Moon. On July 6, 2012, Kodansha and Toei Animation announced that it would commence production of a new anime adaptation of Sailor Moon, called Sailor Moon Crystal, for a simultaneous worldwide release in 2013 as part of the series' 20th anniversary celebrations. Crystal premiered on July 5, 2014, and episodes would premiere on the first and third Saturdays of each month. Kotono Mitsuishi reprised her role as Sailor Moon. The first two seasons were released together, covering their corresponding arcs of the manga ("Dark Kingdom" and "Black Moon"). A third season (subtitled "Death Busters" based on the "Infinity" arc on the manga) premiered on April 4, 2016. On January 25, 2017, another sequel was announced. Three animated theatrical feature films based on the original Sailor Moon series have been released in Japan. The films are side-stories that do not correlate with the timeline of the original series. A one-hour television special was aired on TV Asahi in Japan on April 8, 1995. In 1997, an article in Variety stated that The Walt Disney Company was interested in acquiring the rights to Sailor Moon as a live action film to be directed by Stanley Tong. There have been numerous companion books to Sailor Moon. Kodansha released some of these books for each of the five story arcs, collectively called the Original Picture Collection. The books contain cover art, promotional material and other work by Takeuchi. Many of the drawings are accompanied by comments on the way she developed her ideas, created each picture and commentary on the anime interpretation of her story. Another picture collection, Volume Infinity, was released as a self-published, limited-edition artbook after the end of the series in 1997. This art book includes drawings by Takeuchi and her friends, her staff, and many of the voice actors who worked on the anime. In 1999, Kodansha published the Materials Collection; this contained development sketches and notes for nearly every character in the manga, and for some characters that never appeared. Each drawing includes notes by Takeuchi about costume pieces, the mentality of the characters and her feelings about them. It also includes timelines for the story arcs and for the real-life release of products and materials relating to the anime and manga. A short story, Parallel Sailor Moon is also featured, celebrating the year of the rabbit. Sailor Moon was also adapted for publication as novels and released in 1998. The first book was written by Stuart J. Levy and the following written by Lianne Sentar. In mid-1993, the first musical theater production based on Sailor Moon premiered; Anza Ohyama starred as Sailor Moon. Thirty such musicals in all have been produced, with one in pre-production. The shows' stories include anime-inspired plotlines and original material. Music from the series has been released on about 20 memorial albums. The popularity of the musicals has been cited as a reason behind the production of the live-action television series, Pretty Guardian Sailor Moon. During the original run musicals ran in the winter and summer of each year, with summer musicals staged at the Sunshine Theater in the Ikebukuro area of Tokyo. In the winter, musicals toured to other large cities in Japan, including Osaka, Fukuoka, Nagoya, Shizuoka, Kanazawa, Sendai, Saga, Oita, Yamagata and Fukushima. The final incarnation of the first run, New Legend of Kaguya Island (Revised Edition) (新・かぐや島伝説 <改訂版>, Shin Kaguyashima Densetsu (Kaiteban)), went on stage in January 2005, following which, Bandai officially put the series on a hiatus. On June 2, 2013, Fumio Osano announced on his Twitter page that the Sailor Moon musicals would begin again in September 2013. The 20th anniversary show La Reconquista ran from September 13 to 23 at Shibuya's AiiA Theater Tokyo, with Satomi Ōkubo as Sailor Moon. Satomi Ōkubo reprised the role in the 2014 production Petite Étrangère which ran from August 21 to September 7, 2014, again at AiiA Theater Tokyo. At the 1998 Anime Expo convention in Los Angeles, the music video was shown. It has since been copied numerous times and has been viewed on many streaming video sites. Because of the relatively poor quality of the source video and circulated footage, many anime fans thought that the music video was actually a leaked trailer for the project. [original research?] Additional copies of the footage have since been uploaded to the Internet and served only to bolster the mistaken assumption, in addition to incorrectly citing the production to Saban Entertainment, who became known for a similar treatment that created the Power Rangers series. In 1998, Frank Ward, along with his company Renaissance-Atlantic Entertainment, tried to revive the idea of doing a live-action series based on Sailor Moon, this time called Team Angel, without the involvement of Toon Makers. A 2-minute reel was produced and sent to Bandai America, but was also rejected. In 2003, Toei Company produced a Japanese live-action Sailor Moon television series using the new translated English title of Pretty Guardian Sailor Moon. Its 49 episodes were broadcast on Chubu-Nippon Broadcasting from October 4, 2003 to September 25, 2004. Pretty Guardian Sailor Moon featured Miyuu Sawai as Usagi Tsukino, Rika Izumi (credited as Chisaki Hama) as Ami Mizuno, Keiko Kitagawa as Rei Hino, Mew Azama as Makoto Kino, Ayaka Komatsu as Minako Aino, Jouji Shibue as Mamoru Chiba, Keiko Han reprising her voice role as Luna from the original anime and Kappei Yamaguchi voicing Artemis. The series was an alternate retelling of the Dark Kingdom arc, adding a storyline different from that in the manga and first anime series, with original characters and new plot developments. In addition to the main episodes, two direct-to-video releases appeared after the show ended its television broadcast. "Special Act" is set four years after the main storyline ends, and shows the wedding of the two main characters. "Act Zero" is a prequel showing the origins of Sailor V and Tuxedo Mask. The Sailor Moon franchise has spawned several video games across various genres and platforms. Most were made by Bandai and its subsidy Angel; others were produced by Banpresto. The early games were side-scrolling fighters; later ones were unique puzzle games, or versus fighting games. Another Story was a turn-based role-playing video game. The only Sailor Moon game produced outside Japan, 3VR New Media's The 3D Adventures of Sailor Moon, went on sale in North America in 1997. A video game called Sailor Moon: La Luna Splende (Sailor Moon: The Shining Moon) was released on March 16, 2011 for the Nintendo DS. The Dyskami Publishing Company released Sailor Moon Crystal Dice Challenge, created by James Ernest of Cheapass Games and based on the Button Men tabletop game in 2017, and Sailor Moon Crystal Truth or Bluff in 2018. A Sailor Moon attraction, "Pretty Guardian Sailor Moon: The Miracle 4-D", exists at Universal Studios Japan. Sailor Moon is one of the most popular manga series of all time and continues to enjoy high readership worldwide. More than one million copies of its tankōbon volumes had been sold in Japan by the end of 1995.:95 By the series' 20th anniversary in 2012, the manga had sold over 35 million copies in over fifty countries, and the franchise generated $5 billion in merchandise sales. The manga won the Kodansha Manga Award in 1993 for shōjo. The English adaptations of both the manga and the anime series became the first successful shōjo title in the United States. The character of Sailor Moon is recognized as one of the most important and popular female superheroes of all time. Sailor Moon has also become popular internationally. Sailor Moon was broadcast in Spain and France beginning in December 1993; these became the first countries outside Japan to broadcast the series. It was later aired in Russia, South Korea, the Philippines, China, Italy, Taiwan, Thailand, Indonesia and Hong Kong, before North America picked up the franchise for adaptation. In the Philippines, Sailor Moon was one of its carrier network's main draws, helping it to become the third-biggest network in the country. :10–11 In 2001, the Sailor Moon manga was Tokyopop's best selling property, outselling the next-best selling titles by at least a factor of 1.5. In Diamond Comic Distributors's May 1999 "Graphic Novel and Trade Paperback" category, Sailor Moon Volume 3 was the best-selling comic book in the United States. In his 2007 book Manga: The Complete Guide, Jason Thompson gave the manga series three stars out of four. He enjoyed the blending of shōnen and shōjo styles and said the combat scenes seemed heavily influenced by Saint Seiya, but shorter and less bloody. He also said the manga itself appeared similar to Super Sentai television shows. Thompson found the series fun and entertaining, but said the repetitive plot lines were a detriment to the title, which the increasing quality of art could not make up for; even so, he called the series "sweet, effective entertainment." Thompson said although the audience for Sailor Moon is both male and female, Takeuchi does not use excessive fanservice for males, which would run the risk of alienating her female audience. Thompson said fight scenes are not physical and "boil down to their purest form of a clash of wills", which he says "makes thematic sense" for the manga. Comparing the manga and anime, Sylvain Durand said the manga artwork is "gorgeous", but its storytelling is more compressed and erratic and the anime has more character development. Durand said "the sense of tragedy is greater" in the manga's telling of the "fall of the Silver Millennium," giving more detail about the origins of the Shitennou and on Usagi's final battle with Beryl and Metaria. Durand said the anime omits information that makes the story easy to understand, but judges the anime more "coherent" with a better balance of comedy and tragedy, whereas the manga is "more tragic" and focused on Usagi and Mamoru's romance. 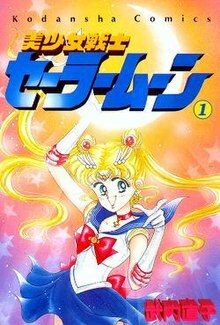 For the week of September 11, 2011, to September 17, 2011, the first volume of the re-released Sailor Moon manga was the best-selling manga on The New York Times Manga Best Sellers list, with the first volume of Codename: Sailor V in second place. The first print run of the first volume sold out after four weeks. With their dynamic heroines and action-oriented plots, many attribute the manga and anime series to reinvigorating the magical girl genre. After its success, many similar magical girl series, including Magic Knight Rayearth, Wedding Peach, Nurse Angel Ririka SOS, Saint Tail and Pretty Cure, emerged. :199 Sailor Moon has been called "the biggest breakthrough" in English-dubbed anime until 1995, when it premiered on YTV,:10–11 and "the pinnacle of little kid shōjo anime." Cultural anthropologist Matt Thorn said that soon after Sailor Moon, shōjo manga started appearing in book shops instead of fandom-dominated comic shops. The series are credited as beginning a wider movement of girls taking up shōjo manga. Canadian librarian Gilles Poitras defines a generation of anime fans as those who were introduced to anime by Sailor Moon in the 1990s, saying they were both much younger than other fans and were also mostly female. Historian Fred Patten credits Takeuchi with popularizing the concept of a Super Sentai-like team of magical girls, and Paul Gravett credits the series with revitalizing the magical girl genre itself. A reviewer for THEM Anime Reviews also credited the anime series with changing the genre—its heroine must use her powers to fight evil, not simply have fun as previous magical girls had done. The series has also been compared to Mighty Morphin Power Rangers, Buffy the Vampire Slayer:281 and Sabrina the Teenage Witch. Sailor Moon also influenced the development of Miraculous: Tales of Ladybug & Cat Noir, W.I.T.C.H., Winx Club, LoliRock, Star vs. the Forces of Evil, and Totally Spies!. In western culture, Sailor Moon is sometimes associated with the feminist and Girl Power movements and with empowering its viewers, especially regarding the "credible, charismatic and independent" characterizations of the Sailor Soldiers, which were "interpreted in France as an unambiguously feminist position". Although Sailor Moon is regarded as empowering to women and feminism in concept, through the aggressive nature and strong personalities of the Sailor Soldiers, it is a specific type of feminist concept where "traditional feminine ideals [are] incorporated into characters that act in traditionally male capacities". While the Sailor Soldiers are strong, independent fighters who thwart evil—which is generally a masculine stereotype—they are also ideally feminized in the transformation of the Sailor Soldiers from teenage girls into magical girls, with heavy emphasis on jewelry, make-up and their highly sexualized outfits with cleavage, short skirts, and accentuated waists. The most notable hyper-feminine features of the Sailor Soldiers—and most other females in Japanese girls' comics—are the girls' thin bodies, long legs, and, in particular, round, orb-like eyes. Eyes are commonly known as the primal source within characters where emotion is evoked—sensitive characters have larger eyes than insensitive ones. Male characters generally have smaller eyes that have no sparkle or shine in them like the eyes of the female characters. The stereotypical role of women in Japanese culture is to undertake romantic and loving feelings; therefore, the prevalence of hyper-feminine qualities like the openness of the female eye in Japanese girls' comics is clearly exhibited in Sailor Moon. Thus, Sailor Moon emphasizes a type of feminist model by combining traditional masculine action with traditional female affection and sexuality through the Sailor Soldiers. Its characters are often described with "catty stereotypes", Sailor Moon's character, in particular, being singled out as less than feminist. In English-speaking countries, Sailor Moon developed a cult following among anime fans and male university students. Patrick Drazen says the Internet was a new medium that fans used to communicate and played a role in the popularity of Sailor Moon. :281 Fans could use the Internet to communicate about the series, organize campaigns to return Sailor Moon to U.S. broadcast, to share information about episodes that had not yet aired, or to write fan fiction. In 2004, one study said there were 3,335,000 websites about Sailor Moon, compared to 491,000 for Mickey Mouse. Gemma Cox of Neo magazine said part of the series' allure was that fans communicated via the Internet about the differences between the dub and the original version. The Sailor Moon fandom was described in 1997 as being "small and dispersed." In a United States study, twelve children paid rapt attention to the fighting scenes in Sailor Moon, although when asked whether they thought Sailor Moon was violent, only two said yes and the other ten described the episodes as "soft" or "cute." ^ a b Takeuchi, Naoko (1994). Pretty Soldier Sailor Moon Original Picture Collection vol. I (1st ed.). Japan: Kodansha. ISBN 4063245071. ^ "美少女戦士セーラームーン新装版（１）". kc.kodansha.co.jp (in Japanese). Kodansha Comics. Retrieved October 20, 2016. ^ "美少女戦士セーラームーン　完全版（１）". kc.kodansha.co.jp (in Japanese). Kodansha Comics. Retrieved October 20, 2016. ^ a b "Pretty Soldier Sailor Moon DVD-COLLECTION Vol.1" 美少女戦士セーラームーン DVD‐COLLECTION Vol.1. toei-video.co.jp (in Japanese). Toei Video. Archived from the original on July 14, 2014. Retrieved October 20, 2016. ^ a b "Pretty Soldier Sailor Moon DVD-COLLECTION Vol.2 (End)" 美少女戦士セーラームーン DVD‐COLLECTION Vol.2(完). toei-video.co.jp (in Japanese). Toei Video. Archived from the original on October 18, 2014. Retrieved October 20, 2016. ^ a b c Takeuchi, Naoko (2013). "Pretty Guardian Sailor Moon ~Ten Years of Love and Miracles~". Pretty Guardian Sailor Moon: Short Stories. 2. New York: Kodansha Comics. pp. 196–200. ISBN 9781612620107. ^ a b Takeuchi, Naoko (September 2003). Pretty Guardian Sailor Moon shinzōban vol. 2. Kodansha. ISBN 406334777X. ^ Takeuchi, Naoko (December 18, 1993). "Vol. 1". Codename wa Sailor V. 1. Kodansha. ISBN 4063228010. ^ Takeuchi, Naoko (September 29, 2004). "Vol. 1". Codename: Sailor V shinzoban vol. 1. Kodansha. ISBN 4063349292. ^ McCarter, Charles. "Public Interview with Takeuchi Naoko". EX. Wayback Machine. Archived from the original on February 21, 2009. Retrieved October 20, 2016. ^ a b c d e f g Grigsby, Mary (June 1998). "Sailormoon: Manga (Comics) and Anime (Cartoon) Superheroine Meets Barbie: Global Entertainment Commodity Comes to the United States". The Journal of Popular Culture. 32 (1): 59–80. doi:10.1111/j.0022-3840.1998.3201_59.x. ^ a b c d e Drazen, Patrick (2003). Anime Explosion! : The What? Why? & Wow! of Japanese Animation. Berkeley, California: Stone Bridge Press. ISBN 1880656728. ^ a b Allison, Anne (August 4, 2010). "A Challenge to Hollywood? Japanese Character Goods Hit the US". Japanese Studies. 20 (1): 67–88. doi:10.1080/10371390050009075. ^ a b c Takeuchi, Naoko (1999). Prety Soldier Sailor Moon Materials Collection. Tokyo: Kodansha. ISBN 4063245217. ^ a b c Schodt, Frederik L. (1999). Dreamland Japan: Writings on Modern Manga (2nd ed.). Berkeley, California: Stone Bridge Press. ISBN 9781880656235. ^ a b Alverson, Brigid (May 27, 2011). "Sailor Moon 101: Pretty, Powerful, And Pure of Heart". MTV. Archived from the original on April 16, 2018. Retrieved April 16, 2018. ^ a b Takeuchi, Naoko (2003). "Punch!". Pretty Guardian Sailor Moon Volume 3 (Shinsōban ed.). Tokyo: Kodansha. ISBN 4063347834. ^ "Pretty Soldier Sailor Moon (1)" 美少女戦士セーラームーン (1) (in Japanese). Kodansha. Archived from the original on June 20, 2004. Retrieved October 20, 2016. ^ "Pretty Soldier Sailor Moon (18)" 美少女戦士セーラームーン (18) (in Japanese). Kodansha. Archived from the original on May 15, 2012. Retrieved October 20, 2016. ^ "Sailor Moon New Edition (1)" 美少女戦士セーラームーン 新装版(1) (in Japanese). Kodansha. Archived from the original on November 27, 2005. Retrieved October 20, 2016. ^ "Sailor Moon New Edition (1)" 美少女戦士セーラームーン新装版（1）：美少女戦士セーラームーン20周年プロジェクト公式サイト (in Japanese). Sailormoon-official.com. November 16, 2013. Retrieved October 20, 2016. ^ "Sailor Moon New Edition Short Stories (1)" 美少女戦士セーラームーン新装版　ショートストーリーズ（１）. kc.kodansha.co.jp (in Japanese). Kodansha Comics. Retrieved October 20, 2016. ^ "Sailor Moon New Edition Short Stories (2)" 美少女戦士セーラームーン新装版　ショートストーリーズ（２）. kc.kodansha.co.jp (in Japanese). Kodansha Comics. Retrieved October 20, 2016. ^ "Sailor Moon full version (1)" 美少女戦士セーラームーン　完全版（１）. kodansha.co.jp (in Japanese). Kodansha Comics. Retrieved October 20, 2016. ^ Stephenson, Brad (January 23, 2012). "3rd Gen Japanese Sailor Moon Manga Shopping Guide". moonkitty.net. Retrieved December 9, 2013. ^ a b Elly (October 10, 2013). "Sailor Moon Kanzenban + iPad Mini + Smart Phone Cases". Miss Dream. Retrieved December 9, 2013. ^ "Mixx Controversies: Analysis". Features. Anime News Network. August 14, 2008. Retrieved January 24, 2007. ^ "Sailor Moon Volume 1". Mixx Entertainment. Archived from the original on November 7, 2004. Retrieved July 23, 2008. ^ "Sailor Moon StarS Volume 3". Mixx Entertainment. Archived from the original on November 10, 2004. Retrieved July 23, 2008. ^ "Tokyopop Out of Print". October 13, 2007. Archived from the original on October 13, 2007. Retrieved September 10, 2009. ^ "MIXX ENTERTAINMENT COLLABORATES WITH CENTRAL PARK MEDIA TO PUBLISH SAILOR MOON AND PARASYTE COMICS IN THE JAPANIMATION STATION™ SECTION OF AMERICA ONLINE (AOL)". Mixx Entertainment. October 22, 1999. Archived from the original on October 29, 2000. Retrieved August 21, 2011. ^ "Tokyopop Out of Print". Tokyopop. Archived from the original on May 19, 2007. Retrieved October 18, 2006. ^ "Kodansha USA Announces the Return of Sailor Moon". Anime News Network. Press release. March 18, 2011. Retrieved October 20, 2016. ^ "Sailor Moon 1 by Naoko Takeuchi – Book". Random House. September 13, 2011. Retrieved October 20, 2016. ^ "Sailor Moon 1 by Naoko Takeuchi – Book". Random House. Retrieved October 20, 2016. ^ "Codename Sailor V 1 by Naoko Takeuchi – Book". Random House. Retrieved October 20, 2016. ^ "Sailor Moon Short Stories 1 by Naoko Takeuchi – Book". Random House. Retrieved October 20, 2016. ^ "Sailor Moon Short Stories 2 by Naoko Takeuchi – Book". Random House. Retrieved October 20, 2016. ^ "Sailor Moon Vol. 1". Turnaround Publisher Services. Retrieved August 20, 2014. ^ "Sailor Moon 5". Random House Australia. Retrieved October 20, 2016. ^ "Издательство XL Media приобрело права на мангу Pretty Guardian Sailor Moon". Eksmo Publishing (XL Media subdivision) (in Russian). May 24, 2018. Retrieved August 14, 2018. ^ "Sailor Moon staff information". Usagi.org. Retrieved September 10, 2013. ^ "Sailor Moon Manga Gets New Anime in Summer 2013". Anime News Network. July 6, 2012. Retrieved October 20, 2016. ^ Zahed, Ramin (July 6, 2012). "New 'Sailor Moon' Reboot Arrives in 2013". Animation Magazine. Retrieved July 9, 2012. ^ Mohajer-Va-Pesaran, Daphne (July 3, 2013). "Happy birthday, Sailor Moon!". The Japan Times. Retrieved July 5, 2014. ^ "New Sailor Moon Anime's Producer: Not Remaking 1st Anime". Anime News Network. January 9, 2014. Retrieved October 20, 2016. ^ "Kotono Mitsuishi Leads New Sailor Moon Crystal Anime Cast". Anime News Network. April 27, 2014. Retrieved October 20, 2016. ^ "Kotono Mitsuishi Leads New Sailor Moon Crystal Anime Cast". Anime News Network. Retrieved October 26, 2017. ^ "Sailor Moon Crystal 3rd Season's Premiere Date, Theme Songs Revealed - News". Anime News Network. March 6, 2016. Retrieved October 20, 2016. ^ "Sailor Moon Crystal Anime Gets Sequel". Anime News Network. January 25, 2017. Retrieved January 25, 2017. ^ "Sailor Moon SuperS Special". Sailor Moon SuperS (in Japanese). April 8, 1995. TV Asahi. ^ Takeuchi, Naoko (August 1994). Pretty Soldier Sailor Moon Volume II Original Picture Collection. Kodansha. ISBN 406324508X. ^ Takeuchi, Naoko (September 1996). Pretty Soldier Sailor Moon Volume III Original Picture Collection. Kodansha. ISBN 4063245187. ^ Takeuchi, Naoko (September 1996). Pretty Soldier Sailor Moon Volume IV Original Picture Collection. Kodansha. ISBN 4063245195. ^ Takeuchi, Naoko (August 1997). Pretty Soldier Sailor Moon Volume V Original Picture Collection. Kodansha. ISBN 4063245225. ^ "Sailor Moon: The Novels by Tokyopop/SMILE Books". Miss Dream. Retrieved April 2, 2018. ^ "Video DVD Corner" セーラームーン ビデオ・DVDコーナー (in Japanese). Sailor Moon Channel. Archived from the original on February 7, 2009. Retrieved October 20, 2016. ^ a b Font, Dillon (May 2004). "Sailor Soldiers, Saban Style". Animefringe. Retrieved July 20, 2009. ^ "93 Summer Special Musical Pretty Soldier Sailor Moon Gaiden Dark Kingdom Resurrection Hen" これまでの公演の紹介 93サマースペシャルミュージカル 美少女戦士セーラームーン 外伝 ダーク・キングダム復活篇 (in Japanese). Sailormoon. Channel. Archived from the original on July 14, 2009. Retrieved October 20, 2016. ^ "94 Summer Special Musical Pretty Soldier Sailor Moon S way to the rabbit-love of the warrior" これまでの公演の紹介 ９４サマースペシャルミュージカル美少女戦士セーラームーンＳうさぎ・愛の戦士への道 (in Japanese). Sailormoon. Channel. Archived from the original on April 29, 2008. Retrieved October 20, 2016. ^ "95 Spring Special Musical Pretty Soldier Sailor Moon S road to makeover Super Warrior (revised edition)" ９５スプリングスペシャルミュージカル 美少女戦士セーラームーンS 変身・スーパー戦士への道(改訂版) (in Japanese). Sailormoon. Channel. Archived from the original on February 26, 2008. Retrieved October 20, 2016. ^ Lobão, David Denis (May 24, 2007). "Musicais do OhaYO! – Parte 2" (in Portuguese). Universo Online. Retrieved July 24, 2009. ^ "Osabu Twitter" (in Japanese). Retrieved June 2, 2013. ^ a b Arnold, Adam. "Saban Moon". Crystal Millennium of Commemoration. Retrieved October 20, 2016. ^ D'Anastasio, Cecilia (July 17, 2018). "We Tried To Uncover The Long-Lost 'American Sailor Moon' And Found Something Incredible". Kotaku. Retrieved July 20, 2018. ^ "Sailormoon. Channel – History of Sailor Moon". sailormoon.channel.or.jp (in Japanese). Sailor Moon Channel. Archived from the original on August 6, 2007. Retrieved October 20, 2016. ^ "Sailormoon. Channel – Sailor Moon Live Action TV Corner" 「美少女戦士セーラームーン」 (in Japanese). Archived from the original on June 17, 2007. Retrieved October 20, 2016. ^ Mays, Jonathon (April 6, 2004). "Pretty Guardian Sailor Moon – Review". Anime News Network. Retrieved July 20, 2009. ^ "Live-action plate DVD (TV series)" 実写板DVD(TVシリーズ) (in Japanese). Sailormoon. Channel. Archived from the original on February 1, 2009. Retrieved October 20, 2016. ^ "Game Search". GameFAQs - Video Game Cheats, Reviews, FAQs, Message Boards, and More. Retrieved August 5, 2014. ^ "The 3D Adventures of Sailor Moon for PC". GameFAQs. Retrieved September 10, 2013. ^ Loo, Egan (September 16, 2011). "New Sailor Moon DS Game to Ship in Spring in Italy – Interest". Anime News Network. Retrieved October 20, 2016. ^ "Sailor Moon Crystal Tabletop Games Announcement". Anime News Network. April 26, 2017. Retrieved February 21, 2018. ^ "Sailor Moon Crystal Gets 2 Board Games This Year". Anime News Network. April 27, 2017. Retrieved February 21, 2018. ^ "Sailor Moon Crystal Dice Challenge". Dyskami Publishing Company. Retrieved February 21, 2018. ^ "Pretty Guardian Sailor Moon: The Miracle 4-D". Universal Studios Japan. Retrieved September 9, 2018. ^ "Happy 20th Anniversary to Sailor Moon!". Kodansha Comics. June 29, 2012. Retrieved July 28, 2015. ^ Hahn, Joel. "Kodansha Manga Awards". Comic Book Awards Almanac. Archived from the original on October 21, 2007. Retrieved August 21, 2007. ^ a b c d Thompson, Jason (2007). Manga: The Complete Guide. New York: Del Rey Books. p. 309. ISBN 9780345485908. ^ Berlatsky, Noah (September 7, 2011). "Can Sailor Moon Break Up the Superhero Boys Club?". The Atlantic. Retrieved October 20, 2016. ^ "Sailor Moon superhero may replace Power Rangers". Ludington Daily News. February 14, 1995. Retrieved October 20, 2016. ^ Misiroglu, Gina; Roach, David A. (2004). The Superhero Book: The Ultimate Encyclopedia of Comic-book Icons and Hollywood Heroes (1st ed.). Detroit, Michigan: Visible Ink Press. p. 711. ISBN 9781578591541. Retrieved October 20, 2016. ^ Comella, Anthony (March 24, 2013). "Grrrl Power: Why Female Superheroes Matter". Pop Mythology. Retrieved October 20, 2016. ^ "Sailor Moon History 1993" セーラームーンのあゆみ　1993年 (in Japanese). Sailormoon. Channel. Archived from the original on July 15, 2009. Retrieved October 20, 2016. ^ Flinn, Tom (August 14, 2001). "Sailor Moon Graphic Novels Top Bookstore Sales – Demonstrates Shoujo's Potential". ICv2. Retrieved October 20, 2016. ^ "MIXX'S SAILOR MOON MANGA IS THE NUMBER 1 GRAPHIC NOVEL OR TRADE PAPERBACK IN AMERICA!". Mixx Entertainment. Wayback Machine. June 18, 1999. Archived from the original on October 29, 2000. Retrieved April 3, 2017. ^ Thompson, Jason (March 3, 2011). "Sailor Moon – Jason Thompson's House of 1000 Manga". Anime News Network. Retrieved October 20, 2016. ^ Durand, Sylvain (March – April 1996). "Sailor Moon: Manga vs Animation". Protoculture Addicts (39): 39. ^ Taylor, Ihsan (October 2, 2011). "Best Sellers – The New York Times". NY Times. Retrieved October 20, 2016. ^ "New York Times Manga Best Seller List, September 11–17". Anime News Network. September 23, 2011. Retrieved October 20, 2016. ^ "Kodansha: Sailor Moon 1 Reprinted after 50,000 Sell Out". Anime News Network. October 14, 2011. Retrieved October 20, 2016. ^ a b Poitras, Gilles (2004). Anime Essentials: Every Thing a Fan Needs to Know (4th ed.). Berkeley, California: Stone Bridge Press. pp. 31–32. ISBN 1880656531. ^ Sevakis, Justin (January 1, 1999). "Anime and Teen Culture... Uh-oh". Anime News Network. Retrieved July 19, 2009. ^ Alverson, Brigid (February 17, 2009). "Matt Thorn Returns to Translation". Publishers Weekly. PWxyz, LLC. Retrieved December 27, 2011. ^ Deppey, Dirk (2005). "She's Got Her Own Thing Now". The Comics Journal (269). Archived from the original on May 31, 2008. Retrieved June 22, 2008. Scratch a modern-day manga fangirl, and you're likely to find someone who watched Sailor Moon when she was young. ^ Sebastian, Trisha L. (November 2002). "Taking One for the Team: A Look at Sentai Shows". Sequential Tart. Retrieved October 20, 2016. ^ Patten, Fred (2011). Watching Anime, Reading Manga 25 Years of Essays and Reviews. New York: Stone Bridge Press. p. 50. ISBN 1611725100. ^ Gravett, Paul (2004). Manga: Sixty Years of Japanese Comics (2nd ed.). London: Laurence King. p. 78. ISBN 1856693910. ^ Christi (c. 1992). "Sailor Moon". THEMAnime.org. T.H.E.M. Anime Reviews. Retrieved October 20, 2016. ^ Craig, Timothy J. (2000). "Sailor Moon: Japanese Superheroes for Global Girls". Japan Pop! : Inside the World of Japanese Popular Culture. Armonk, New York: Sharpe. pp. 259–278. ISBN 9780765605610. ^ "Animerica: Animerica Feature: Separated at Birth? Buffy vs. Sailor Moon". Animerica. c. 1999. Archived from the original on April 7, 2004. Retrieved October 20, 2016. ^ "Animerica: Animerica Feature: Separated at Birth? Buffy vs. Sailor Moon". Animerica. Archived from the original on April 7, 2004. Retrieved October 20, 2016. ^ Yoshida, Kaori (2002). "Evolution of Female Heroes: Carnival Mode of Gender Representation in Anime". Western Washington University. Western Washington University. Archived from the original on August 31, 2013. Retrieved October 20, 2016. ^ Saito, Kumiko (January 2, 2014). "Magic, Shōjo, and Metamorphosis: Magical Girl Anime and the Challenges of Changing Gender Identities in Japanese Society". The Journal of Asian Studies. 73 (01): 143–164. doi:10.1017/S0021911813001708. ^ Newsom, Victoria Anne (2004). "Young Females as Super Heroes: Super heroines in the Animated 'Sailor Moon'". Femspec. 5: 57–81. ^ Penedo, Nicolas (2008). Nicolas Finet (ed.). Dicomanga: le dictionnaire encyclopédique de la bande dessinée japonaise (in French). Paris: Fleurus. p. 464. ISBN 9782215079316. ^ a b c d e Newsom, Victoria (c. 2004). "Young Females as Super Heroes: Superheroines in the Animated Sailor Moon". femspec.org. Femspec. Retrieved October 20, 2016. ^ a b Brown, Lousie (July 27, 1996). "Sailing the Internet It's a treasure trove of trivia for Sailor 'Moonies'". pqarchiver.com. The Toronto Star. Retrieved October 20, 2016. ^ Matsumoto, Jon (June 19, 1996). "Fans Sending an SOS for 'Sailor'". Los Angeles Times. Retrieved October 20, 2016. ^ Faiola, Anthony (December 6, 2004). "We're Playing Their Toons". Washington Post. Archived from the original on July 11, 2010. Retrieved October 20, 2016. ^ Cox, Gemma (January 2005). "Shôjo Classic - Sailor Moon". Neo. Archived from the original on January 1, 2008. Retrieved August 5, 2009. ^ Updike, Edith (1997). "The Novice Who Tamed The Web". Business Week. Archived from the original on March 4, 2016. Retrieved October 20, 2016. ^ Allison, Anne (2001). "Cyborg Violence: Bursting Borders and Bodies with Queer Machines" (PDF). Cultural Anthropology. Duke University. 16 (2): 237–265. doi:10.1525/can.2001.16.2.237. Archived from the original (PDF) on June 10, 2007. Retrieved October 20, 2016. Wikimedia Commons has media related to Sailor Moon. Sailor Moon at Don Markstein's Toonopedia. Archived from the original on February 10, 2017.